Above is a picture of the subject of my next review. That was a very long-winded way of saying that I am doing a review of some mascara. The Sophisticated Volume Stretch Mascara to be exact. And yes, it is P2 Cosmetics again. Why would I not buy it at the dirt cheap price of €3.75. Sure, I’d be a fool not too! Main question: Was it any good? Yes sir, it sure was. I got it in clack because that is the only colour I use. 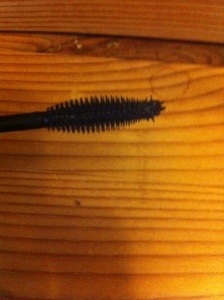 It was initially the name of the mascara which caught my attention, but it was the brush that sold the deal. A combination of oval shape, bristles of various lengths and the flexible brush ensures that it applies like a dream. The first coat is perfect for day way, but I like to build it up with three for extra emphasis. 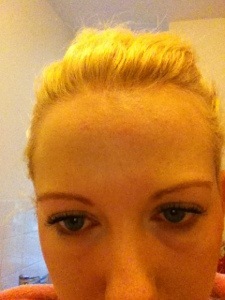 Below is a (dodgy) picture of me with freshly applied mascara. Unfortunately, there is one negative. The mascara drops under my eyes quite easily, more so if I have been briskly walking or something to that effect. Not a massive issue as it happens just once or twice throughout the day, but still grates on the nerves a bit. 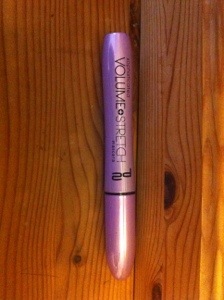 Overall, this is a really good mascara for somebody on a budget. While I still find myself favouring the Clinique mascara range despite the much higher price, I will be repurchasing this again.